Implementing advanced zoning options is a sure-fire away to attain significant energy savings, especially when retrofitting central heating controls into old buildings. This is exactly the case with Gresley Old Hall’s community welfare centre, in Church Gresley, a popular South Derbyshire venue that will save quite a bit on their energy bills following the replacement of their central heating system. Funded by a £10,000 Lottery grant, their new central heating system will benefit from zoning controls, which should enable them to attain significant savings on their energy bills. 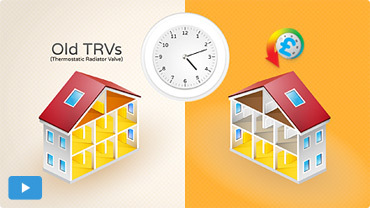 Savings of up to 30% on average energy bills can be achieved when using the HeatSave wireless thermostatic radiator valves together with the HeatingSave Building Energy Management Systems (BEMS), thereby optimizing energy consumption across your home. The HeatSave wireless thermostatic valves represent a very good solution for any household. That’s because the TRVs can help customers slash their energy bills by up to an impressive 30 percent by allowing them to thoroughly control the heating patterns for every single one of their radiators.